Return basic presentation fill area aspect, NULL by default. When set, might be used instead of Color() property. Returns basic presentation color, Quantity_NOC_WHITE by default. Returns basic presentation color (including alpha channel). Returns display mode, 0 by default. -1 means undefined (main display mode of presentation to be used). Returns highlight method, Aspect_TOHM_COLOR by default. Sets basic presentation fill area aspect. Sets basic presentation color (RGB components, does not modifies transparency). Changes highlight method to the given one. Sets basic presentation transparency (0 - opaque, 1 - fully transparent). Returns basic presentation transparency (0 - opaque, 1 - fully transparent), 0 by default (opaque). Returns presentation Zlayer, Graphic3d_ZLayerId_Default by default. 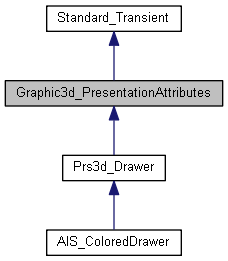 Graphic3d_ZLayerId_UNKNOWN means undefined (a layer of main presentation to be used).